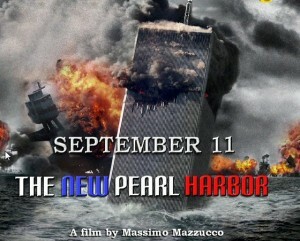 The documentary “September 11 – The New Pearl Harbor” is available here. ReOpen911: Good afternoon Massimo. Can you tell us a little about yourself? Massimo Mazzucco: Yes. My name is Massimo Mazzucco. I am a director and screenwriter. I am also the webmaster of an Italian news website, luogocomune.net, which first went on line in 2004. The site addresses issues relating to the September 11 terrorist attacks. Later, as the years went by, the topic was broadened to include history’s “greatest conspiracies” from the assassination of John F. Kennedy to Big Pharma and from global economic crises to environmental issues. I believe the most important thing is not the issue that we are addressing but the manner in which each issue is addressed. If we use an analytical approach based exclusively on well-documented facts, we can address any issue without the fear of being proved wrong. If on the contrary we adopt a dogmatic approach based on what is only thought or believed, people could easily say, “But everyone knows very well that…” This is the best way of discrediting even the most solid and verifiable piece of evidence. R911: Again another film on the topic of 911. What is it that sets your film apart from other films like Loose Change, Zero and the like? MM: I’d already done a documentary on 911 (“Inganno globale” or Global Deceit in English) along the same lines as Loose Change or Zero and many others in which I’d explained all the inconsistencies and omissions in the official version, i.e. the report of the 911 Commission. But this film is different because, for the first time, it consolidates all of the Truth Movement’s positions as well as the answers provided by those who seek to prove the movement wrong, the debunkers. Said otherwise, the public is finally given the opportunity to consider both sides’ opinions and to judge for themselves what they think really happened on September 11, 2001. R911: Does the film provide any new evidence about 911? MM: A lot of new evidence has been produced these past few years. One of the most important items by far was NIST’s 2008 report on the collapse of Building 7. Paradoxically, the document provides all the proof required to demonstrate that the official version is a lie. The NIST report recognizes the fact that Building 7 collapsed in free fall over almost a third of the time it took the building to fall. Consequently, NIST implicitly admits that controlled demolition was used. (There is no other explanation in the world for a collapse to occur at free-fall speed other than by use of explosives.) I also discovered other interesting facts when documenting the film, but as for that, I prefer that the audience discovers these facts for themselves by seeing the film on line. R911: What audience does the film target? MM: The film targets a wide audience that may not even know very much about the events of September 11. This means—rather unfortunately—about 99% of the world’s population. Understandably, and as I suggested earlier, 911 researchers and experts are also expected to find certain new items that I bring to the debate to be of interest. R911: You speak of “ten years of debate on the subject of September 11”. Yet there has really been no debate. The most significant questions are always avoided. Is this not true? R911: Yes, it’s true that we always see the same techniques used on television programs in different countries. conclusions. These situations systematically finish by showing favor to the debunkers, whose aim is, like the broadcasters, to confuse the public and not to provide them with a clear understanding of the facts. In France for example, there was the program “Objet du Scandale” that ran several episodes focusing on September 11. The program featured France’s national debunker, Jérôme Quirant, who always got the best out of every episode. You know it’s quite easy to go on television and say, “The conspiracists have never been able to produce the smallest bit of evidence proving the official version to be incorrect”, when others are given practically no time to prove their point and, in addition, they are not prepared to do so. R911: By all means, the balance is tilted before the battle begins. Do you have any proposals to avoid this type of situation? MM: After many years of debating, on the radio, on television and on the internet, I realized that there was only one way to convince audiences in this type of confrontation. Now, I put a very precise question to the debunkers at the outset of the debate which immediately channels their answers and denies them the possibility of escape. If for example you say, “We can see squibs coming out the sides of both Twin Towers as they collapse.” Quirant would respond by saying, “These squibs are caused by air pressure that results from the upper floors collapsing upon the lower floors.” Then you are not given the chance to rebuke because the host has already given the floor to someone else. If on the contrary you say, “We can see squibs coming out the sides of both Twin Towers as they collapse which cannot be caused by air pressure because they are 20 to 40 floors under the collapsing floors, and they cannot be caused by the transfer of air from the elevator shafts or staircases, because of such and such a reason…” And in that situation, he will have a lot more trouble responding, he will hesitate, and you will win the first set 6-0. R911: You mean leave no room for escape or for turnkey answers as soon as you formulate the question? MM: Exactly. If you said, “They found debris from United flight 93 seven and a half miles away from the point of impact.” Quirant would respond by saying, “That was simply scraps of paper and very light objects carried off by the wind.” There it would be very difficult for you to come back with a better response. If instead of that, right from the beginning, you said, “Can you explain to me how it is possible that debris from United flight 93—and these are not just scraps of paper, but solid pieces of debris, as reported by CNN—was found seven and a half miles from the point of impact, on a day when there was only a slight breeze blowing?” He would not be able to respond, or he would hesitate, and you would win the second set 6-0 as well. It’s simply a question of dialect. The more your question is precise and well-planned the more the debunker will be obliged to recognize that there is no valid answer. This is why my film is five hours long. I took each issue and i) presented it in detail for those who are unaware of it, ii) let the debunkers provide their explanations regarding the issue, and iii) explained to the audience why their explanations are not valid. And to drive my point home throughout the documentary, I posed a clear and precise question using the criteria described earlier at the end of each segment of the film. The ultimate goal it to demonstrate that, in reality, the debunkers, despite all they say, provide no valid justification that can maintain the credibility of the official version of what happened on September 11. This requires very thorough research that is sometimes quite tedious. (It is not particularly exciting to have to explain that air pressure from the 70th floor cannot blow out a window at the 40th floor.) But, it was absolutely essential in order to break the blockade that the debunkers had created by telling all these incredible lies about 911. Remember that in ’04 and ’05, there was the myth of the official version that had to be proved wrong. Today, we must battle two distinctive tiers of lies that must be unraveled, one covering the other. The first tier is that of the official version, while the second is comprised of the more than ten lies that debunkers made up over the years in order to cover up the initial lies of the official version. R911: Why do you draw similarities to Pearl Harbor? MM: The film was, above all, made with the American public in mind. The American people are the ones who must resolve the issue of 911 from a psychological perspective. As long as they have not done this, then the problem will persist throughout the rest of the world. So I chose to present the parallel with Pearl Harbor because, for the American people, this event had an enormous impact on people’s lives, again, from a psychological perspective. By choosing to start the film by presenting the 12 parallels between Pearl Harbor and September 11, I was looking to show the American public the way in which the same mechanisms were repeated in 2001, in the hope that they would accept this overwhelming truth—that has once again become a reality today. R911: Despite the extended length of the documentary (5 hours in all), certain important arguments are not presented, namely the nano-thermite debate, the tracking of the terrorists by the CIA and FBI, the pages omitted from the report that point to Saudi Arabia and Pakistan, Israel’s involvement, Ben Laden’s hospitalization and his meeting with the CIA just prior to 911, to name the most significant issues. Why is this so? Is this simply because there was not enough time, or do you estimate that these arguments are less convincing? MM: Aside from the introduction which is for “historical” effect, my film focuses exclusively on the debate of the events of September 11. What is most important for me is to demonstrate that, beyond any doubt, the official version of what occurred on that day is fundamentally wrong. To me it is completely useless to say that Ben Laden received emergency hospital care in Karachi on the evening of September 10, under the direction of Pakistani secret service agents, when people still believe that it was the impacts of the two airliners that caused the collapse of both Twin Towers. The first item of information does not collocate with the second, and remains up for grabs, because the public has no idea how to interpret it. “OK,” the viewer will say,”So Ben Laden needed emergence dialysis treatment. But that does not mean that someone else orchestrated the operation in his place the next day. ” If one does not begin by explaining that “the operation” is a total lie, the viewer will not know how to deal with information that is “political” in nature. You must first deliver a series of solid pieces of evidence to work from, and only then can you paint the whole picture. That is why I had made a first film on 911, “Global Deceit”, that addressed only the facts about September 11, while I consolidated the “political” or “historic” information in a second film entitled “The New American Century”. If not, the viewer would have been overwhelmed by the mass of information that conflicts with other information, and in the end, he or she would refute, from a psychological perspective all the information being received. R911: And, what about the other issues that you did not cover? MM: Insofar as concerns the other factual issues about the attacks, such as thermite, this was a strategic choice that hinges on the dynamics of the debate. Our role is to ask questions, we must not seek to provide answers. From the moment that we draw a conclusion about the events of September 11—no matter how valid it may be—the debunker will immediately respond by asking us for proof and then wait to see what we will say. If for example you would say, “They used thermite”, he will ask you to prove it, and you will have only a minute to defend the credibility of a certain publication by comparing it to another, when it is up to the debunker to defend the official version. And you must do this despite whatever the case may be; whether you are right or wrong, or whether your justification is valid or not. What is worse is that we know our arguments are justifiably correct, yet we are not on trial where we have to present our case to a jury that is willing to hear our case and—in theory—an impartial one. In our situation, we go before a public that is ill-informed and not prepared to do the math, a public that is much more responsive to emotion rather than rigorous logic. What counts, in the end, is that we avoid the trap of being endlessly questioned and that the questions fall on the debunker, not on us. There once again, it is a simple question of dialect for which justification of undeniable proof is a decisive weapon in the debate. Look at what it cost Meyssan—and the entire Truth Movement as well—when we chose to say, “It was a missile that struck the Pentagon.” Since that day, there has not been a single television program or documentary in the world that did not take advantage of the situation by saying, “The conspiracists contend that it was a missile that struck the Pentagon. But that can’t be true because of this and that and because eyewitnesses saw a Boeing, and bla bla bla… “. All of a sudden, it’s not the debunkers that have to explain what hit the Pentagon because we have put ourselves in a position of having to prove that it was a missile (or that they used thermite in the Twin Towers, or that some of the terrorists are still alive, etc.). R911: Yes, but in the film, you provide certain answers to viewers, for example, by suggesting that the airliners were in fact drones, or when you say that the passengers were obliged to make their telephone calls from the ground. MM: That’s true, but I do it only in extreme situations when, using narrative, I intentionally place the viewer in the situation of a “logical dead end”. If I were to say i) “The presumed hijackers did not have enough piloting skills to fly the airplanes in the manner that they were flown,” and ii) “No civil aviation pilot would ever have let his airplane crash into a building full of people, much let alone do it himself,” the viewer will find himself lost for a logical explanation and would ask himself, “Then who was flying the airplanes?” At this point, I would have to propose at least one plausible solution, if I want to remain credible. But I do this very cautiously, while I avoid making any affirmation that this is the only solution possible. R911: Do you ever get the impression that the more credible the 911 Movement’s arguments become, the less we have a chance of getting a response? have to make our voices heard, in mainstream media, is to continue to produce our evidence. We have no choice but to take this rout. And in order to get through to mainstream media, our strategy must be very precise for anyone that would be tempted to speak about 911 on television: never use this proof to put the program directors up against a wall. For example, it would be beautiful to see Kassovitz and Bigard dumbfound the debunkers with a well-formed question like the ones I described earlier. But it would be a catastrophe to corner a television program ringleader with the same type of question. R911: Do you mean to say that we should spare the journalists their integrity despite the almost unilateral silence they’ve been giving us up to now? MM: That is exactly what we must do. You must always keep in mind that television lives off its audience and that it is constantly looking for new topics to present to the public. That is why some channels are always tempted to program hot topics that will certainly spark interest—like September 11—provided that they are guaranteed they will not be harmed in doing so, and that the image they project is left unscathed. Consequently, if we adopt an aggressive stance toward journalists, and if we directly accuse them of intentionally ignoring the hard proof we’ve put together, they will continue to flee confrontation in order to avoid responding to our accusations. If, conversely, we offer them the possibility, on the one hand, to defend our opinions and present our arguments in a well-documented manner, and on the other hand, if, instead of pointing a finger at them, we point it to the ones who defend the official version, sooner or later, a desire to broadcast more solid and convincing theories about 911 will prevail in the face of producers’ fears of “getting burned” and ruining their image in the public eye. Mainstream media is called mainstream media for a good reason. This is because they reflect the position of mainstream thinking at a precise moment in time, i.e. a majority of the population at a specific point in history. In reality, they reflect the majority of the population as much as they influence it. To one extent, the media know very well just how far they can go without without generating a negative reaction from viewers; to another extent, they try to push the limit further and further because they also know that this is the best way of increasing their ratings. R911: But isn’t there what some people call “an almost impenetrable psychological barrier”? MM: Yes, indeed. As we all know, the most important questions about September 11 have little to do with what actually happened that day but are more concerned with the human psyche. To envisage that there was a conspiracy among the highest placed officials in the US government means admitting that we can no longer have faith in our governments, and although some people do believe that is what happened, for a vast majority of people (mainstream thinkers) it still is a very difficult issue to confront. We should advance cautiously, without ruffling feathers and without imposing our theories on others. The issue today is not being right but being able to relay to the general public useful information that will enable them to draw their own conclusions, when they are prepared to deal with that information. Naturally, the faster that can happen, the better off everyone will be. That is why I’d like to thank those who help make this film known to others in your country.